Looking for a fun way to mix it up? 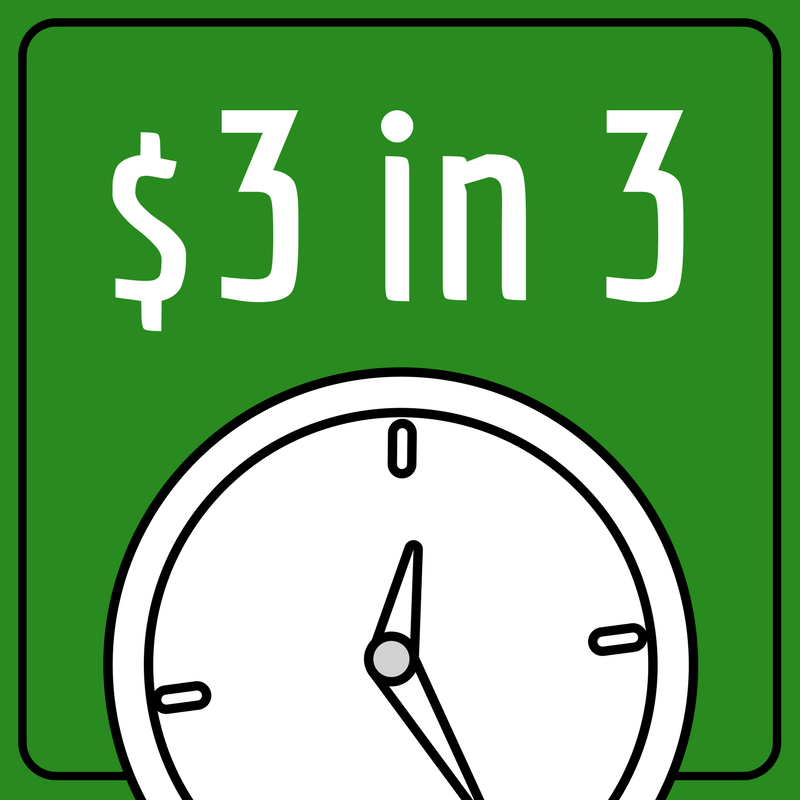 We’ve got you covered with our brand new game, $3 in 3 (minutes). The game requires a bit of leg work ahead of time, but the game itself is super simple and an absolute blast! Before you meet with your group, pick a day to take your contestants to the store. Tell them that they will be given $3 to shop for one of the other contestants (you can pick randomly or assign them another person). The catch is that they only have 3 minutes to pick whatever they can find. Let them know that they can not tell anyone what they got and not to share with the others who they were shopping for. We went to the Dollar Tree, so I just went in with them and filmed them on my cell phone. You can do the filming if you want or bring someone to do it for you. Once you have all the footage, select about 30 seconds per contestant, edit it together (several apps like iMovie will do this easily if you’re not an editing wizard) and slap our graphic on the front of the video and you’re good to go. We recommend that you explain the game on camera before they all go in so you can just roll the video. The trick is to not show what everyone got, just what they looked at since everyone will see the video first. Then move to your reveal in person by bringing everyone up front with their item(s). Our kids bought each other things they like, but for your game they can purchase things that will get a laugh. Have fun with it and let them get creative! Special Credit to Cody Fort, who helped shape the game idea. 1. Put some music in the background of the video to keep it entertaining and engaging. 2. Get creative! Shop at Goodwill or a local thrift store. 3. Make it even bigger! Do $10 in 10 or $20 in $20, or $100 in… well, that might be too much. 4. Tease the video on social media if you have a fun event or share it after you’re done. Remember to catch the reveal if you’re doing it after. Get more great games and tips by subscribing to our blog, liking us on Facebook & following us on Twitter @stumingames! And if you want to catch more craziness from our family, subscribe to our YouTube channel, Life with Five.